The American Indian’s horse is depicted in movies as small, tough, resilient and a true survivor. They may have looked shaggy and unkempt by today’s standards, but their appearance belied an indomitable spirit that was highly valued by their native American owners. History tells us that these small horses first saw the shores of America in the 1550’s thanks to the Spaniards. The Spanish Conquistadors also conquered the oceans moving horses across the Atlantic. Their mounts were a mix of Barb, Arabians and Andalusian horses which at that time were considered to be the cream of the equine crop, and Cortez thanked his four-legged equine partners when he conquered Mexico. Indians had never seen horses before this, so they held them in highest esteem (almost godlike) and were not allowed to own them for years. Eventually, the Indians got over their starry-eyed amazement and with the acceptance of these “God Dogs” or “Big Dogs” their lives were transformed from plodding nomads with small dogs that carried their possessions, to worriors and hunters with large tepees and a wider and greater living area. Their hunting methods were also changed forever and running after a herd of buffalo and sending them all off a cliff was replaced by hunting on horseback with only the choicest and largest animals being killed. The Indians revered their horses and stealing another tribe’s equines was a completely honourable sport for the young plains Indians. Horses meant wealth and were often used as gifts, and bartered for other goods and honoured in various Indians cults. The Oglala Dakota tribe had an elaborate cult that featured a dance in imitation of horses and, the horse medicine men and women of the tribe were among the most respected. Their horse medicines were used to influence the outcome of races, to cure sick and wounded horses, to calm horses and to ensure mares had good foals. A photo of Comanche in 1867. Perhaps the most famous horse associated with Indian history was Comanche, the supposed only survivor of the battle of Little Bighorn also known as Custer’s Last Stand, from 1876-1877. When reinforcements arrived, General Custer and more than 200 of his soldiers were dead. Comanche was wounded, but still standing and was nursed back to health. He became a symbol, a hero, an icon and the people believed incorrectly that he had been Custer’s horse and that he was the sole battle survivor. The Army encouraged these myths and Comanche toured the country as the Army whipped up enthusiasm for Indian wars. 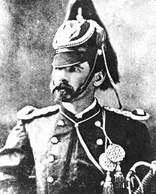 Captain Keogh was the soldier who actually rode Comanche at The Battle of Little Bighorn. Comanche died in 1890, at Fort Riley, and his body was sent to the University of Kansas Natural History Museum to be stuffed. However, either unwilling to pay the bill or knowing that most Indians were either dead or captured, poor old Comanche never left the Museum except for one short jaunt to Chicago in 1893. Hail Stones were for a prayer for hail to fall on the enemy. Hoof prints were drawn on the horse to show how many enemy horses were captured. The Battle Scars were always painted with a red hand and the Pat Hand symbols were made by the left hand drawn on a horse’s right hip, the latter showing that the horse had brought his owner home safely. The Upside Down hand print meant a do-or-die mission and was the most prized symbol. Apache and Comanche warriors who were dying in battle would pat their horse’s neck with a bloodied hand and the horse would return home with this grim news for all to see. Indians knotted their horse’s manes to prevent their bows and arrows from getting tangled. They also knotted the horse’s tail in an effort to prevent the enemy from taking hold of it and unseating his rider.